While an intranet platform is effective for any team in your organization, the Human Resources (HR) department stands to benefit the most. HR is a major part of any business, helping to make sure that employees are happy, productive, and lacking concerns that get in the way of productivity and engagement. Anything that makes life easier for HR professionals within your company is something to focus on, and this is where intranet software has its advantages. As with anything, there are varying degrees an HR intranet's effectiveness ... and a lot has to do with how people approach it. There are many ways your Human Resources department can take full advantage of your intranet platform. Some HR intranet benefits will be inherent immediately upon login, but there are other less obvious benefits that are especially effective. 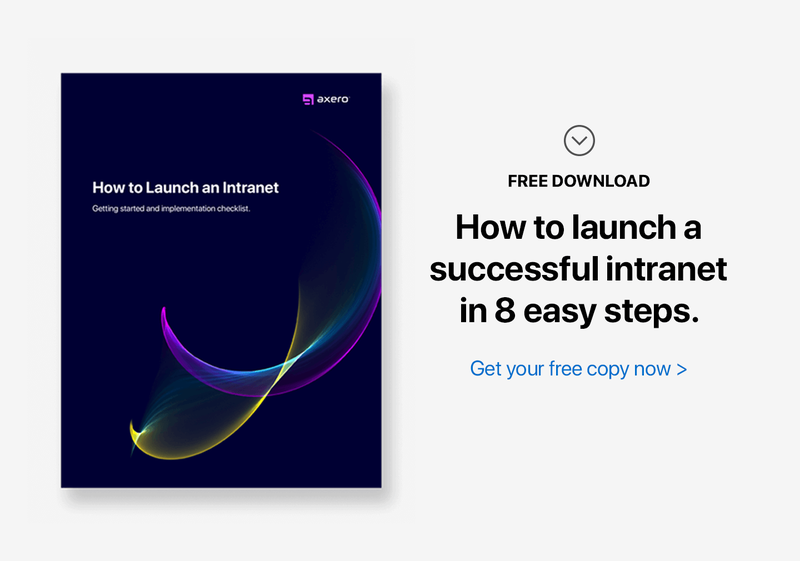 The following HR intranet tips will ensure that your HR team is able to make full use of the company intranet, even if they're completely new to the concept of a virtual community. Your intranet is like an employee. It requires training, information, and guidance to work. And, like an employee, your intranet can take your organization to new heights when performing well. By treating your HR intranet as an employee, you’ll be able to develop and maintain it properly. The great thing about today's intranets is customization. This has made it possible to tweak preferences so they fit the exact needs of your business. Setting up the intranet in a way that will help you streamline workflows is one of the most important things to do. For best results, design your intranet so it betters your organization and acts as glue instead of a solvent. HR professionals have so much on their plates that keeping track of everything can seem impossible. Unfortunately, this is because they have numerous repetitive responsibilities to tend to, and many of these could be handled in a better way. The good news here is that time-consuming responsibilities can be cut down if you take the right approach, and your HR intranet serves as the perfect platform. When you have a system for performance reviews, surveys, etc., dealing with a large number of employees becomes easier. You can automate this process even further by conducting these, and other HR responsibilities, through the intranet itself, cutting down on the time you need to spend in face-to-face situations. This is especially helpful with a geographically dispersed team or when managing remote employees. A great way to cut down your workload is to consolidate processes. This is a major perk of the modern social intranet, as consolidation of processes has never been such a strong possibility. This helps save the organization money while freeing up time so that people can focus on what truly matters. For HR professionals, it's often necessary to use several software applications to get through the week. Take scheduling for example, which many people use third-party applications to manage. When you login to your HR intranet, you can handle scheduling, project management, and many other processes that might otherwise require alternative software. Training employees is another important function of the HR department. This is especially true for organizations that hire remote employees, in which case the process can often involve many one-on-one interactions through email or some other virtual communication platform. Indeed, training employees virtually is a challenge if you don't have the right business communication tools, but strong instances of social intranet software can make the process a breeze. When you use your HR intranet as a tool for training employees, the headaches will disappear. Since you can hold group training sessions, you can maximize your time, and employees will have plenty of opportunities to ask questions if they get confused. You can also outfit the social community with training documentation, ensuring everyone will know where to go should they have questions. In large organizations, it is challenging for HR professionals to know everyone who works at the company. This can increase the chances of alienation among employees, which can be disastrous to any organization. One of the many benefits of a modern social intranet is that it allows employees to create profiles ... much like the online social networks they are already familiar with. This allows people, even at large organizations, to understand and get to know each other better. Even though employee profiles are incredibly useful when properly completed, it's common for some staff members to procrastinate when creating one. Stress the importance of completing a profile, the brief amount of time needed to complete one, and you'll have far greater success with completions. Every HR professional knows that hiring from within comes with substantial benefits. When you hire from within, any onboarding and employee engagement issues are lessened dramatically. And your HR intranet is a great tool to make this happen. Your company intranet can serve many purposes, and you may not realize that it can serve as a virtual job board. When you post positions internally, your employees will be happy to know they're getting first-crack at a job, and the hiring process will be largely streamlined. This is also an excellent way to encourage staff members to focus on upward movement and motivate them to apply for positions that might otherwise go overlooked. It's really quite impressive how many ways an HR department can use online workspaces in social intranet software. Most managers and CEOs focus on work-related ways to get the most out of "spaces", but they can also be used to help people unwind during a busy workweek. A "Water Cooler" space is one that allows employees to engage in discussions that aren't work related. This helps increase employee engagement and get people to work together in a more efficient manner. If you want, you can even create a variety of water cooler chat spaces devoted to niche interests. There is no end to how many spaces a community can have. HR departments are responsible for keeping staff members well-informed about what is going on within the organization. This may seem like a relatively easy task, but it's time-consuming when there is a steady stream of new and changing information. Not surprisingly, your HR intranet can come in handy here as well, and learning how to use it to the fullest extent is essential. You can keep people up to date about changes in policy, employee agreements, any issues regarding productivity, or any other intranet news. All of these elements are essential to keep employees well-informed of the happenings within the organization, and HR teams will save valuable time disseminating the information on your social intranet platform. Keeping track of hours has historically been a difficult task for organizations to manage, yet accurate time management is critical for many reasons. When hours are misreported, the fallout can be passed on to clients, who may sever relationships and cause problems as a result. Therefore, streamlined time-sheet management is extremely important. An effective way to ensure that hours are properly and consistently reported is to make time-tracking as easy as possible. A good HR intranet platform can offer solutions to this as well. This goes back to #3 above ... with everything in one central location, staff members won't have to move from one application to the next to report hours, lessening the potential for mistakes. HR teams have many priorities when using a social intranet, but a crucial factor is proper knowledge management. When knowledge management within the social community is streamlined, finding and recalling information becomes far easier. This leads to higher productivity levels among staff members. Improving knowledge management can be a long and tedious process, but there are things you can do to ensure you're on the right track. Think of your intranet as a giant organizational system that holds your company's knowledge. Naturally, it's impossible to efficiently use an organizational system that is not properly managed. Therefore, clear labeling and regular purging of old or unnecessary materials is essential to streamlining knowledge management. Human Resources is often viewed as a one-way street, but this viewpoint overlooks how employees and managers should interact. A great organization is one where employees and management treat each other with a high level of respect, which unfortunately can be difficult to come by. This being said, HR departments can help improve mutual respect by giving employees a chance to offer feedback, and a social intranet makes this a possibility. One of the best ways to get feedback from employees is to offer a virtual comment box on the intranet. This breaks down any barriers that might exist and ensures that people feel comfortable talking about what's bothering them ... or offering praise for a job well done. You might also use the HR intranet to interact one-on-one with employees when seeking more specific feedback. A major reason why today's forward-thinking managers and CEOs are implementing social intranet software is because these platforms are used as benchmark vehicles for communication and collaboration. Email is not the only option for employees looking to connect and collaborate. Today, the social intranet is an email alternative, and it has taken these problems and eradicated them entirely. Because intranet software makes collaboration a straightforward and simple process, HR departments can facilitate collaboration merely by educating them on the HR intranet. This can come in the form of a training session, but should also include consistent reminders of the benefits of collaboration within the social community. The impact that education can have on employees can be impressive, and there are always new learning opportunities to take advantage of. In the past, presenting such opportunities to an entire company was difficult, and making these opportunities available to remote employees was nearly impossible. Today however, the web has made it easy to find and share great learning opportunities. Finding the right platform to present these opportunities is no longer an issue either, as your HR intranet serves as the perfect tool. Even if employees don't have the time to embrace new learning opportunities at the moment, they'll appreciate the fact that you're looking to help them grow. Highlight online courses and webinars that relate to what your staff is faced with on a daily basis, as this can help improve your organization as a whole. Part of being a great HR team is being able to identify employees who are performing well within an organization and those who might extra attention to achieve peak performance. It only takes one person to derail an organization, especially if they're in a leadership role. Being able to isolate such an issue and deal with it in a swift, professional manner is essential, and most people don't realize that an intranet platform makes this process much easier. A well-designed HR intranet makes monitoring performance a simple, daily process. Paying attention to how people use the intranet is a great way to identify trends and put together a plan to help people make better use of the community. Over time, you might see that certain people fall off performance-wise, and the sooner you can take action to correct such an issue, the better. Making your organization stand out as a unique entity is important for promoting overall growth, and there are many ways to achieve this goal. One of the most effective ways is to promote your brand and company culture, both internally and externally. There are many tools you can use to aid in this promotion but your HR intranet is the best for promoting internally. Colors, tag-lines, and internal lingo can all help improve company culture on your intranet, as can promoting media that relates to the core values and philosophies of your organization. A strong sense of company culture helps to improve employee engagement, which results in greater productivity levels and useful ideas and solutions. Modern HR teams have a lot to gain from using social intranet software, and remembering the above tips will ensure things go smoothly once you take the plunge. If, once implemented, you focus on improving workflows for your staff, you'll have nothing to lose and everything to gain. What’s the Latest in Internal Communications Trends for 2018? Is Your Intranet the Best Place to Work?